To coincide with Half Term, London Welsh will descend on Oxford, in full force this Wednesday, starting with an open training session at St Edwards school and many other events around the City.So why not come on down and meet the players and coaches. 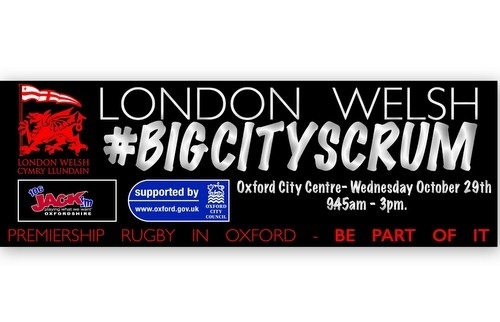 London Welsh will be taking over Oxford City centre on Wednesday 29th October for the Club’s first ‘Big City Scrum’ event. In association with the Club’s partners, St Edward’s School, Jack FM and Oxford City Council, the day will begin with an open training session at St Edward’s School, Woodstock Road, between 9:30am and 11:15am, followed by an autograph session, before the whole London Welsh squad will be getting out and about in the city centre to meet supporters. Some of the squad will be trying their hand at some unusual roles – you might just get your food served to you that lunchtime by a London Welsh player! FREE OPEN Training Session - watch the Premiership coaches deliver a session to the whole squad as they prepare for the LV Cup Gloucester match on November 9th. London Welsh #BIGCITYSCRUM as London Welsh take over Bonn Square from 1pm. What: Richard Thorpe & Josh McNally will be on the road with JACK FM. Give them a wave and come and say hello!